An attempt to make an attempt from base camp t o K2’s summit has failed. The attempt was between 2 small teams. this included Fredrik Strang, 5 Pakistani climbers, and 3 Polish climbers: Janusz Gołąb; Andrzej Bargiel and Kuba Poburka. It failed because the Polish climbers decided to turn around. Janusz Gołąb was struggling with an infection and had to turn around. Further, Andrzej Bargiel said that there was rock fall that was increasing. The Polish climbers decided that it was too risky to continue. It looks like their expedition is over. Fredrik Strang seems to be disappointed about this. He is now not sure what to do. A decision will be made in the coming days. Fredrik Strang has said that his next attempt at K2’s summit will depend on the weather in the next few days. If he does try again then he will take the Cesen route and not the Abruzzi Ridge. He said he would do this because of bad conditions on the Abruzzi. He would likely mean avalanches and possible rock fall. After 12 climbers made the summit of K2 yesterday, they stayed at C4 last night. Today within the last hour they have started to descend to base camp today. It was a truly brave effort from the climbers yesterday. All reports were that it was not an easy climb even to the lower camps. The weather was good as predicted for summit day. Yet the going was slow and there must have been deep snow. In particular Mingma G and his team of Sherpas deserve praise for making the right decision, and their incredible effort. It is possible that without his team there would have been no summit yesterday. He did say that they finally made the summit. It is pretty clear that they underestimated conditions at the summit. Vanessa O’Brien has reached the summit of K2 after a huge effort on summit day. So far she has been climbing for 16 1/2 hours. This is a long time climbing, even for summit day on K2. She has posted on her twitter that she made thew summit. The local time in Pakistan is 4pm. She will be trying to get past the bottleneck before 7pm when it starts getting dark. 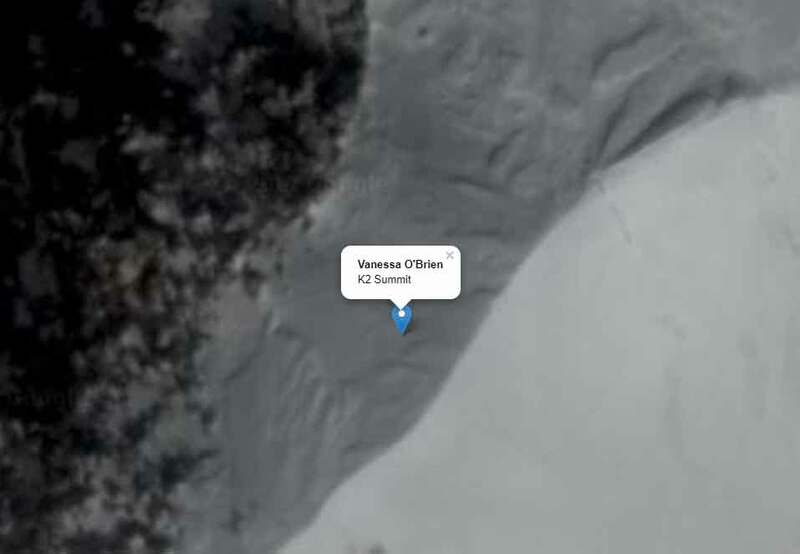 The GPS of both Vanessa O’Brien and John Snorri Sigurjonsson have them within metres of K2’s summit. One would assume that they are there or minutes away from being at the summit. Sigurjonsson has been recorded at a height of 8602m. K2 is 8611m high. O’Briens GPS heights have been less reliable. More information will be needed for her location. So far they have climbed nearly 16 hours. They will want to get down as quick as possible if they have made the summit, before darkness. The part after the bottleneck seems to have taken the climbers much longer than they thought. Vanessa O’Brien has nearly been climbing for 15 hours today. At present she is at 8516m which is less than 100m than the summit of K2. This is just before 3pm Pakistan time. Time will be an issue on the way down, and she will want to make the summit as quick as possible so there is enough daylight to descend. At 1:15 Pakistan time, John Snorri Sigurjónsson was less than 80m from the summit of K2. He was at 8535m. It seems as if the last bit of the climb to the summit has gone much quicker than near and around the bottleneck. From GPS Vanessa O’Brien is behind him at 8346m. Mingma G has updated has Facebook and said that 12 climbers are within an hour of the summit of K2. There were 14 climbers at the start of the climb. Vanessa O’Brien wais at 8276.844m about an hour ago. Whereas John Snorri Sigurjónsson is at 8324m. He has less than 300m to the summit. He may have passed the bottleneck. John Snorri Sigurjónsson has been making progress in his quest for K2’s summit. He is now at 8237m and less than 400m from the summit. His GPS shows that he has been climbing for over 9 hours. He and the other climbers still have time to make the summit. You are currently browsing the K2 Blog blog archives for July, 2017.